Home › Listings › Diversified Industries › Gunpowder Capital Corp.
Gunpowder Capital Corp., Signs an LOI to Commence a Joint Venture Commercial Hemp Production Farm With Grange Conservation LLC. Gunpowder Capital Corp., Enters into a strategic relationship with Hemp Inc., (OTC PINK: HEMP) with the purpose of entering into the Industrial Hemp Industry in the United States. Eighteen Fifty Equity Inc., Engages Gunpowder Capital Corp.
Gunpowder Capital Corp., Receives $102,750.00 CDN in Compensation, Makes Strategic Investment, Settles Debt. 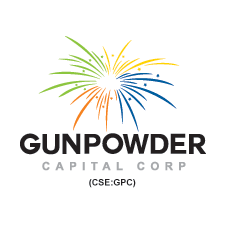 2016-0512 – Fundamental Change - Silver Shield Resources Corp./Gunpowder Capital Corp.
Pursuant to a Fundamental Change Review, Gunpowder Capital Corp., the issuer resulting from a Fundamental Change of Silver Shield Resources Corp. has been approved for listing. Trading to commence Monday December 7, 2015 under the symbol SSR.